This glittering collection of stars is located in the center of an interstellar cloud formed by gas and dust – which, according to the NASA, are the materials needed to form stars. This cluster of huge, hot stars is known as NGC 3603. It’s located in the Carina constellation, which is around 20,000 light-years from Earth. 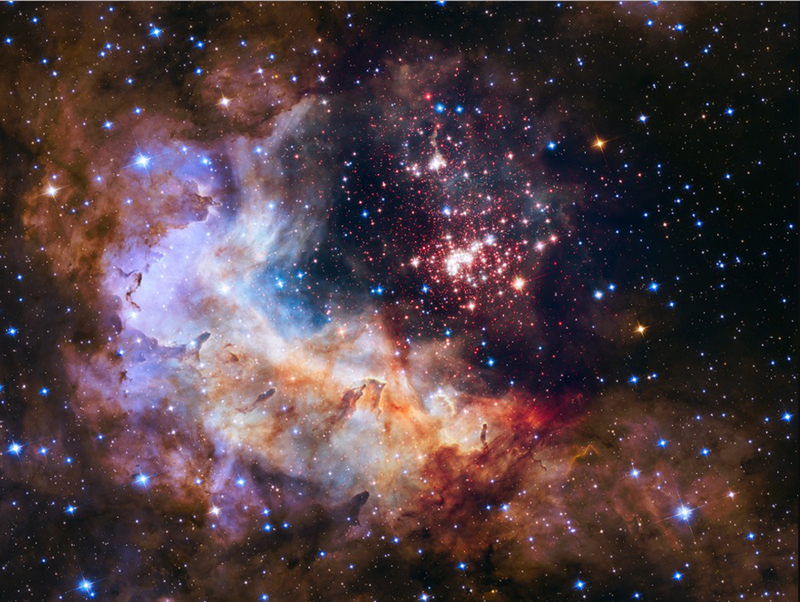 “Like a July 4th fireworks display a young, glittering collection of stars looks like an aerial burst,” NASA told in a press after releasing the pictures – which are two images combined and taken by the Hubble Space Telescope in 2009. These kind of clusters are actually excellent for research. Despite the fact that the pictures make us think that the region seems to be completely quiet and calm, it’s completely the opposite. In fact, this environment is made of a combination of powerful ultraviolet radiation and extremely ferocious stellar winds. That’s why the gas and the dust of the nebula is totally blown away. All of the stars were born at the same time. However, they vary in size, mass, temperature, and color. The mass is what defines how long the life of the star is going to be. This means that, today, all of them could be in different stages, although all of them are the same amount of years lived. This lets scientists analyze with details the stellar life cycles.